Martin Sandler came to Vanderbilt from South Africa as an Internal Medicine physician. He came as a Fellow in Endocrinology. Following its completion he enrolled in and completed his nuclear medicine residency. In 1992, when Leon Partain became Chair of the Radiology Department, Martin became Director of the Division of Nuclear Medicine. Martin’s research included many clinical nuclear medicine publications with emphasis on endocrine systems, and he stimulated several instrumentation developments with industrial collaborators. Close working relationships with El Scint in Israel led to the design and commercialization of a novel PET/SPECT dual-headed Anger camera system. He and Jim Patton evaluated its use for dual isotope single photon Tc-99m, F-18 FDG studies using a high-energy parallel hole collimator. The general consensus after experience with its use as a PET (co-incidence PET) device was that despite its thick crystal its performance in detecting small lesions was not competitive with standard PET devices. In addition, single photon images of Tc-99m were of lower resolution than those obtained with thinner crystal standard Anger cameras. Coincidence PET was not found to be useful, but GE bought the technology and upgraded it as a standard SPECT/CT system. In another collaboration, Martin worked with a different Israeli company in the design and evaluation of a novel cardiac SPECT system. The system uses multiple small solid state (CZT) cameras arrayed along a 90-degree arc. Each detector rotates at its position on the arc separately so that each points at and samples emissions from the heart region in its restricted field of view. This resulted in both increased sensitivity and resolution, and the DSPECT system gained in popularity for cardiac imaging. Martin replaced Partain as Chair of the Radiology Department in 2000 and stimulated research efforts by trainees and Faculty in the Department. 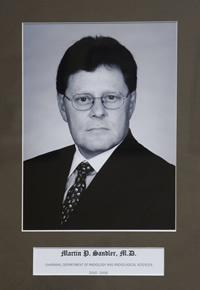 A major addition to the research program was the recruitment of John Gore, and his Yale NMR research colleagues in 2002. His recruits were each given faculty appointments in Radiology, some with secondary appointments in Physics, and others in the Engineering School. To support the expanded imaging program, a new Institute, the Vanderbilt Institute of Imaging Science (VUIIS) was created in 2003. Martin during his term as Chair of Radiology was Editor of the Journal of Nuclear Medicine, and when President of the Society of Nuclear Medicine was also the Vice Chancellor for Health Affairs at Vanderbilt. Jeremy Kay replaced Martin in 2006 when there was a change in Medical Center leadership, at which time Martin returned to the Department as a faculty member doing clinical nuclear medicine, after a sabbatical year getting updated on X-ray CT interpretation. See further information on the Vanderbilt Radiology Website. Bax, J. J., J. A. Patton, D. Poldermans, A. Elhendy and M. P. Sandler (2000). “18-Fluorodeoxyglucose imaging with positron emission tomography and single photon emission computed tomography: cardiac applications.” Semin Nucl Med 30(4): 281-298. Boiskin, I., M. P. Sandler, A. C. Fleischer and W. A. Nylander (1990). “Acute venous thrombosis after pancreas transplantation: diagnosis with duplex Doppler sonography and scintigraphy.” AJR Am J Roentgenol 154(3): 529-531. Boren, E. L., Jr., D. Delbeke, J. A. Patton and M. P. Sandler (1999). “Comparison of FDG PET and positron coincidence detection imaging using a dual-head gamma camera with 5/8-inch NaI(Tl) crystals in patients with suspected body malignancies.” Eur J Nucl Med 26(4): 379-387. Brown, R. K., S. J. Grossman, R. C. Locko, R. J. Lull, C. E. Nagle, R. E. O’Mara, M. P. Sandler and D. Van Nostrand (1995). “The changing practice of nuclear medicine.” J Nucl Med 36(9): 30N-31N, 36N. Cates, C. U., M. W. Kronenberg, H. W. Collins and M. P. Sandler (1989). “Dipyridamole radionuclide ventriculography: a test with high specificity for severe coronary artery disease.” J Am Coll Cardiol 13(4): 841-851. Delbeke, D., C. H. Lorenz, J. R. Votaw, S. T. Silveira, W. H. Frist, J. B. Atkinson, R. M. Kessler and M. P. Sandler (1993). “Estimation of left ventricular mass and infarct size from nitrogen-13-ammonia PET images based on pathological examination of explanted human hearts.” J Nucl Med 34(5): 826-833. Delbeke, D., W. H. Martin, J. A. Patton and M. P. Sandler (2001). “Value of iterative reconstruction, attenuation correction, and image fusion in the interpretation of FDG PET images with an integrated dual-head coincidence camera and X-ray-based attenuation maps.” Radiology 218(1): 163-171. Delbeke, D., W. H. Martin, M. P. Sandler, W. C. Chapman, J. K. Wright, Jr. and C. W. Pinson (1998). “Evaluation of benign vs malignant hepatic lesions with positron emission tomography.” Arch Surg 133(5): 510-515; discussion 515-516. Delbeke, D., J. A. Patton, W. H. Martin and M. P. Sandler (1999). “FDG PET and dual-head gamma camera positron coincidence detection imaging of suspected malignancies and brain disorders.” J Nucl Med 40(1): 110-117. Delbeke, D., T. A. Powers and M. P. Sandler (1989). “Correlative radionuclide and magnetic resonance imaging in evaluation of the spine.” Clin Nucl Med 14(10): 742-749. Delbeke, D. and M. P. Sandler (2000). “The role of hybrid cameras in oncology.” Semin Nucl Med 30(4): 268-280. Delbeke, D., S. Videlefsky, J. A. Patton, M. G. Campbell, W. H. Martin, I. Ohana and M. P. Sandler (1995). “Rest myocardial perfusion/metabolism imaging using simultaneous dual-isotope acquisition SPECT with technetium-99m-MIBI/fluorine-18-FDG.” J Nucl Med 36(11): 2110-2119. Delbeke, D., J. V. Vitola, M. P. Sandler, R. C. Arildsen, T. A. Powers, J. K. Wright, Jr., W. C. Chapman and C. W. Pinson (1997). “Staging recurrent metastatic colorectal carcinoma with PET.” J Nucl Med 38(8): 1196-1201. Dickinson, C. Z., T. A. Powers, M. P. Sandler and C. L. Partain (1984). “Congenital absence of the gallbladder: another cause of false-positive hepatobiliary image.” J Nucl Med 25(1): 70-72. Ertzner, T. W., M. P. Sandler, M. V. Kulkarni, J. A. Patton and M. M. Mazer (1987). “Quantitative evaluation of postembolized splenic tissue using technetium-99m sulfur colloid.” Clin Nucl Med 12(4): 281-286. Falke, T. H. and M. P. Sandler (1994). “Classification of silent adrenal masses: time to get practical.” J Nucl Med 35(7): 1152-1154. Forman, M. B., M. P. Sandler, G. A. Sacks, M. W. Kronenberg and T. A. Powers (1983). “Radionuclide imaging in myocardial sarcoidosis. Demonstration of myocardial uptake of technetium pyrophosphate99m and gallium.” Chest 83(3): 578-580. Garty, I., A. Friedman, M. P. Sandler and A. Kedar (1989). “Neuroblastoma: imaging evaluation by sequential Tc-99m MDP, I-131 MIBG, and Ga-67 citrate studies.” Clin Nucl Med 14(7): 515-522. Greenspan, B. S., M. L. Brown, G. L. Dillehay, M. McBiles, M. P. Sandler, J. E. Seabold and J. C. Sisson (1998). “Procedure guideline for parathyroid scintigraphy. Society of Nuclear Medicine.” J Nucl Med 39(6): 1111-1114. Hansen, A. V., P. J. Lavin, E. B. Moody and M. P. Sandler (1993). “False-negative cerebral radionuclide flow study, in brain death, caused by a ventricular drain.” Clin Nucl Med 18(6): 502-505. Hoff, S. J., J. R. Stewart, W. H. Frist, J. B. Atkinson, M. W. Kronenberg, J. Votaw, R. M. Kessler and M. P. Sandler (1993). “Noninvasive detection of acute rejection in a new experimental model of heart transplantation.” Ann Thorac Surg 56(5): 1074-1077. Hoff, S. J., J. R. Stewart, W. H. Frist, R. M. Kessler, M. P. Sandler, J. B. Atkinson, J. Votaw, J. A. Carey, M. S. Ansari and W. H. Merrill (1992). “Noninvasive detection of heart transplant rejection with positron emission scintigraphy.” Ann Thorac Surg 53(4): 572-577. Johnson, J. A., M. J. Christie, M. P. Sandler, P. F. Parks, Jr., L. Homra and J. J. Kaye (1988). “Detection of occult infection following total joint arthroplasty using sequential technetium-99m HDP bone scintigraphy and indium-111 WBC imaging.” J Nucl Med 29(8): 1347-1353. Knight, S. B., D. Delbeke, J. R. Stewart and M. P. Sandler (1996). “Evaluation of pulmonary lesions with FDG-PET. Comparison of findings in patients with and without a history of prior malignancy.” Chest 109(4): 982-988. Kronenberg, M. W., J. T. Beard, S. M. Stein and M. P. Sandler (1990). “Effects of beta-adrenergic blockade in acute myocardial infarction: evaluation by radionuclide ventriculography.” J Nucl Med 31(5): 557-566. Kronenberg, M. W., M. D. Parrish, D. W. Jenkins, Jr., M. P. Sandler and G. C. Friesinger (1985). “Accuracy of radionuclide ventriculography for estimation of left ventricular volume changes and end-systolic pressure-volume relations.” J Am Coll Cardiol 6(5): 1064-1072. Lee, G. S., M. P. Sandler, J. A. Patton and A. B. Brill (1986). “Serial thyroid iodine content in hyperthyroid patients treated with radioiodine.” Clin Nucl Med 11(2): 115-118. Ludwig, V., T. Komori, D. Kolb, W. H. Martin, M. P. Sandler and D. Delbeke (2002). “Cerebral lesions incidentally detected on 2-deoxy-2-[18F]fluoro-D-glucose positron emission tomography images of patients evaluated for body malignancies.” Mol Imaging Biol 4(5): 359-362. Mackey, E. S., M. P. Sandler, R. M. Campbell, T. P. Graham, Jr., J. B. Atkinson, R. Price and G. A. Moreau (1990). “Right ventricular myocardial mass quantification with magnetic resonance imaging.” Am J Cardiol 65(7): 529-532. Martin, W. H., D. Delbeke, J. A. Patton, B. Hendrix, Z. Weinfeld, I. Ohana, R. M. Kessler and M. P. Sandler (1995). “FDG-SPECT: correlation with FDG-PET.” J Nucl Med 36(6): 988-995. Martin, W. H., D. Delbeke, J. A. Patton and M. P. Sandler (1996). “Detection of malignancies with SPECT versus PET, with 2-[fluorine-18]fluoro-2-deoxy-D-glucose.” Radiology 198(1): 225-231. Moody, E. B., R. C. Dawson, 3rd and M. P. Sandler (1991). “99mTc-HMPAO SPECT imaging in interventional neuroradiology: validation of balloon test occlusion.” AJNR Am J Neuroradiol 12(6): 1043-1044. Patton, J. A., D. Delbeke and M. P. Sandler (2000). “Image fusion using an integrated, dual-head coincidence camera with X-ray tube-based attenuation maps.” J Nucl Med 41(8): 1364-1368. Patton, J. A., M. P. Sandler, I. Ohana and Z. Weinfeld (1996). “High-energy (511-keV) imaging with the scintillation camera.” Radiographics 16(5): 1183-1194. Rose, D. M., D. Delbeke, R. D. Beauchamp, W. C. Chapman, M. P. Sandler, K. W. Sharp, W. O. Richards, J. K. Wright, M. E. Frexes, C. W. Pinson and S. D. Leach (1999). “18Fluorodeoxyglucose-positron emission tomography in the management of patients with suspected pancreatic cancer.” Ann Surg 229(5): 729-737; discussion 737-728. Sandler, M. P. (1988). “The expanding role of MIBG in clinical medicine.” J Nucl Med 29(8): 1457-1459. Sandler, M. P. (2006). “A defining moment: Nuclear medicine, molecular imaging, SNM.” J Nucl Med 47(7): 36N, 37N. Sandler, M. P., J. J. Bax, J. A. Patton, F. C. Visser, W. H. Martin and W. Wijns (1998). “Fluorine-18-fluorodeoxyglucose cardiac imaging using a modified scintillation camera.” J Nucl Med 39(12): 2035-2043. Sandler, M. P. and D. Delbeke (1993). “Radionuclides in endocrine imaging.” Radiol Clin North Am 31(4): 909-921. Sandler, M. P., B. Fellmeth, K. E. Salhany and J. A. Patton (1988). “Thyroid carcinoma masquerading as a solitary benign hyperfunctioning nodule.” Clin Nucl Med 13(6): 410-415. Sandler, M. P. and J. A. Patton (1987). “Multimodality imaging of the thyroid and parathyroid glands.” J Nucl Med 28(1): 122-129. Sandler, M. P. and J. A. Patton (1996). “Fluorine 18-labeled fluorodeoxyglucose myocardial single-photon emission computed tomography: an alternative for determining myocardial viability.” J Nucl Cardiol 3(4): 342-349. Sandler, M. P., J. A. Patton and D. Delbeke (2000). “X-ray, coincidence data merge in functional anatomic mapping.” Diagn Imaging (San Franc) 22(6): 73-77, 79. Sandler, M. P., J. A. Patton and B. M. McCook (1989). “Multimodality imaging of the thyroid gland.” Baillieres Clin Endocrinol Metab 3(1): 89-119. Sandler, M. P., J. A. Patton and R. H. Ossoff (1990). “Recent advances in thyroid imaging.” Otolaryngol Clin North Am 23(2): 251-270. Sandler, M. P. and R. R. Price (1987). “The clinical application of dual photon absorptiometry.” Hosp Physician 23(3): 81, 83. Sandler, M. P., S. Videlefsky, D. Delbeke, J. A. Patton, C. Meyerowitz, W. H. Martin and I. Ohana (1995). “Evaluation of myocardial ischemia using a rest metabolism/stress perfusion protocol with fluorine-18 deoxyglucose/technetium-99m MIBI and dual-isotope simultaneous-acquisition single-photon emission computed tomography.” J Am Coll Cardiol 26(4): 870-878. Tharp, K., O. Israel, J. Hausmann, L. Bettman, W. H. Martin, M. Daitzchman, M. P. Sandler and D. Delbeke (2004). “Impact of 131I-SPECT/CT images obtained with an integrated system in the follow-up of patients with thyroid carcinoma.” Eur J Nucl Med Mol Imaging 31(10): 1435-1442.
van Gils, A. P., T. H. Falke, A. R. van Erkel, J. W. Arndt, M. P. Sandler, A. G. van der Mey and R. P. Hoogma (1991). “MR imaging and MIBG scintigraphy of pheochromocytomas and extraadrenal functioning paragangliomas.” Radiographics 11(1): 37-57. Vansant, J. P., D. H. Johnson, D. M. O’Donnell, J. R. Stewart, A. H. Sonin, B. M. McCook, T. A. Powers, D. J. Salk, W. H. Frist and M. P. Sandler (1992). “Staging lung carcinoma with a Tc-99m labeled monoclonal antibody.” Clin Nucl Med 17(6): 431-438. Vitola, J. V., D. Delbeke, M. P. Sandler, M. G. Campbell, T. A. Powers, J. K. Wright, W. C. Chapman and C. W. Pinson (1996). “Positron emission tomography to stage suspected metastatic colorectal carcinoma to the liver.” Am J Surg 171(1): 21-26. Weaver, G. R., J. A. Johnson and M. P. Sandler (1986). “Inferior vena cava obstruction with hot quadrate lobe on technetium-99m MAA scintivenography.” Clin Nucl Med 11(10): 731-732. Weaver, G. R. and M. P. Sandler (1987). “Increased sensitivity of magnetic resonance imaging compared to radionuclide bone scintigraphy in the detection of lymphoma of the spine.” Clin Nucl Med 12(4): 333-334. Zhao, X. M., D. Delbeke, M. P. Sandler, T. K. Yeoh, J. R. Votaw and W. H. Frist (1995). “Nitrogen-13-ammonia and PET to detect allograft coronary artery disease after heart transplantation: comparison with coronary angiography.” J Nucl Med 36(6): 982-987.